[http://commons.wikimedia.org/wiki/File:Kloster_maria_bildhausen_klosterkirche.jpg Wikimedia Commons]'']] Bildhausen (Maria Bildhausen), a former Cistercian monastery, five miles (eight km) northeast of Münnerstadt in Lower Franconia, [[Germany|Germany]], was in the 19th century the seat of a Mennonite congregation, whose members had come from [[Baden (Germany)|Baden]] and [[Württemberg (Germany)|Württemberg]]. The first Mennonites settled in the region in the last quarter of the 18th century, where the [[Anabaptism|Anabaptists]] had in the 16th century had a large following. Peter Neuschwanger was named as the first settler; he arrived in 1770. Other families soon followed. Services were at first held at various places, and were later transferred to Bildhausen and the adjacent monastery. 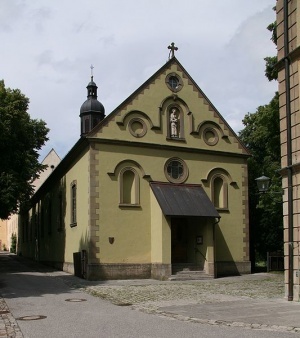 The monastery, which had existed since 1156 and was secularized in 1803, was purchased by two barons of Meiningen. The Mennonite Muselmann family bought half the estate in 1818 for 85,000 guilders. The chapel of the monastery, in a state of collapse, was restored and used by the Mennonites as a church. In 1838 the congregation established a school and supported a teacher, Christian Stauffer of the [[Branchweilerhof (Rheinland-Pfalz, Germany)|Branchweilerhof]] near [[Neustadt an der Weinstrasse (Rheinland-Pfalz, Germany)|Neustadt a.H.]], who, however, soon immigrated to America. On 3 April 1897 the estate and the Rindhof located to the east, which had also long been occupied by Mennonites, was bought by a Catholic order in order to build an institution for mentally handicapped persons (<em>Bote von Grabfeld</em>, 7 April 1897). Since the monastery was sold, Mennonite religious services have been held in [[Trappstadt (Freistaat Bayern, Germany)|Trappstadt]]. Hege, Christian. "Bildhausen (Münnerstadt, Freistaat Bayern, Germany)." Global Anabaptist Mennonite Encyclopedia Online. 1953. Web. 25 Apr 2019. http://gameo.org/index.php?title=Bildhausen_(M%C3%BCnnerstadt,_Freistaat_Bayern,_Germany)&oldid=141045. Hege, Christian. (1953). Bildhausen (Münnerstadt, Freistaat Bayern, Germany). Global Anabaptist Mennonite Encyclopedia Online. Retrieved 25 April 2019, from http://gameo.org/index.php?title=Bildhausen_(M%C3%BCnnerstadt,_Freistaat_Bayern,_Germany)&oldid=141045.